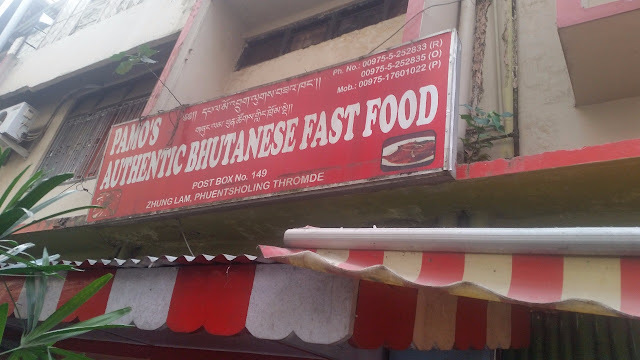 Phuentsholing is a town where any Indian can get free access, you do not need a permit. 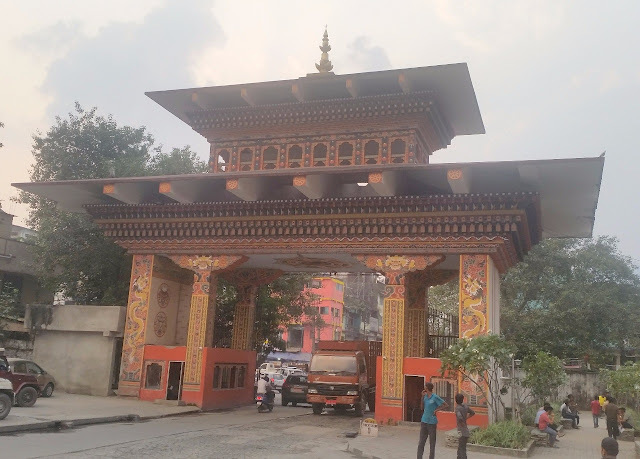 You just need to walk through the Bhutan gate separating the town with Jaigaon on the Indian side of the border. 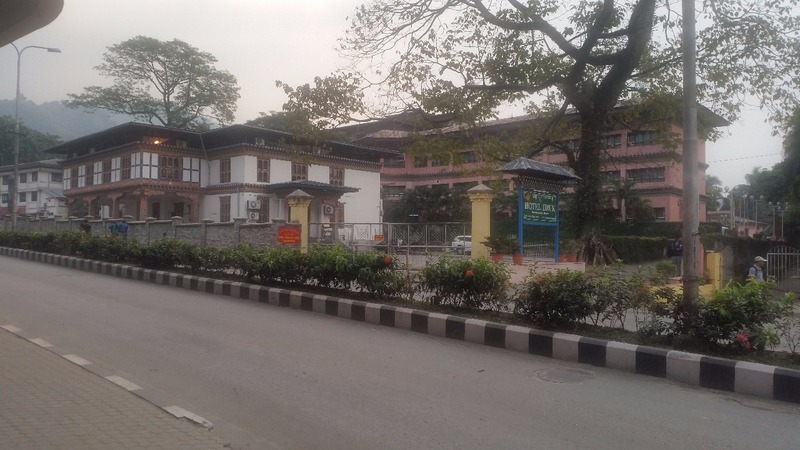 If you plan to go to Thimpu, Paro or other areas of Bhutan, you need to go to the immigration department close to the gate with your Indian passport or Voter’s ID and apply for the permit. After photography and biometrics, the permit is handed over to you within an hour. Our travel agent has an office in Jaigaon, which is our first stop in the afternoon after a scenic journey from Siliguri passing through tea gardens and jungles. We submit photocopies of our documents here. 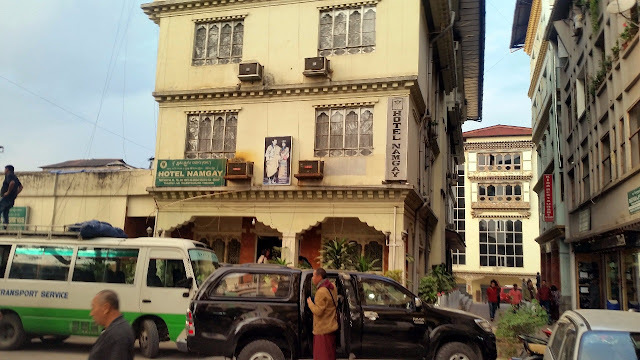 We immediately enter Phuentsholing and check into Hotel Namgay. Soon, a person from the agent walks us down to the immigration office, and the permit is ready in no time. One thing to note is that the immigration office closes at 4 pm Bhutanese time (3:30 pm IST). So it is desirable to reach at least by 2 pm to complete the formalities. The office is closed on weekends and national holidays. While walking down to the government office, we learn our first rule. In any town of Bhutan, you cannot cross a main road anywhere, you will be fined for that. You have to only cross at a designated zebra crossing. After getting our permits in hand, the first task is to get hold of a local SIM. Vodaphone and Airtel have roaming services in Bhutan but the tariff is prohibitively high. By submitting a copy of the permit, we can get a Tourist SIM from either Tashicell or Bhutan Telecom, the two service providers in Bhutan. I get a Tashicell SIM and use it throughout my journey without any issues. The SIM comes at a price of Nu 150 (Bhutanese currency pegged to Indian Rupee 1:1) and a top-up of around Nu 300 was enough for me for my 7day trip including my internet use. Indians do not need to get their currency converted into Bhutanese Nu. Indian Rupee is accepted universally in Bhutan. However, the change is given back in Bhutanese currency so while leaving the country, one may need to change the balance of these into Indian Rupees. With the basic work done for proceeding into the country, we realize that we are completely famished and it is 4 pm. Learning about my interest in Bhutanese cuisine, a good Samaritan takes us to a regular Bhutanese restaurant named Pamo’s quite near the Bhutan gate. A small place with seating for about twenty people, it has the menu written on a whiteboard (later we found out that this is the custom in smaller restaurants all over Bhutan). We promptly order some Ema Datshi and Beef (Norsha) Pa with rice and Ezey, a chilli based chutney. 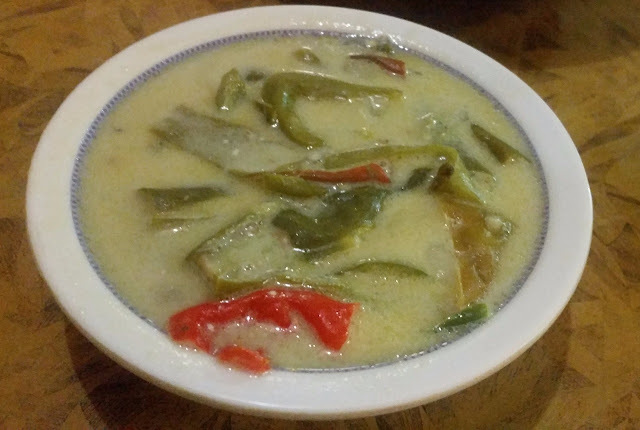 Ema Datshi is the national dish of Bhutan. Ema stands for chillies and datshi is a variety of local cheese. 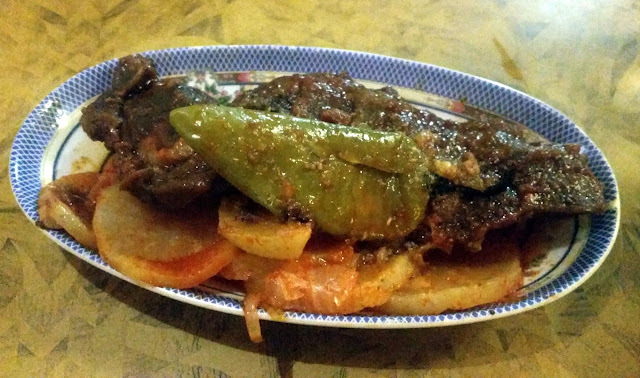 Bhutanese people are very fond of their chillies and they virtually use them in every dish. 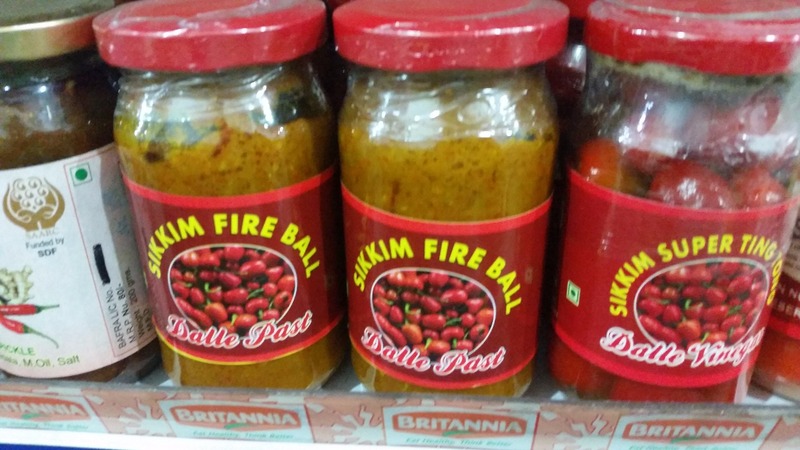 While the Bhutanese variety of chillies are flavourful, dalle the super spicy chillies from North Bengal and Sikkim are often added to provide the kick. It is important for anyone to specify their ability to eat spicy food while ordering in Bhutan, as the default which comes is extremely difficult to negotiate. The dish here is super-hot with both red and green chillies and we need a lot of rice to go with it. 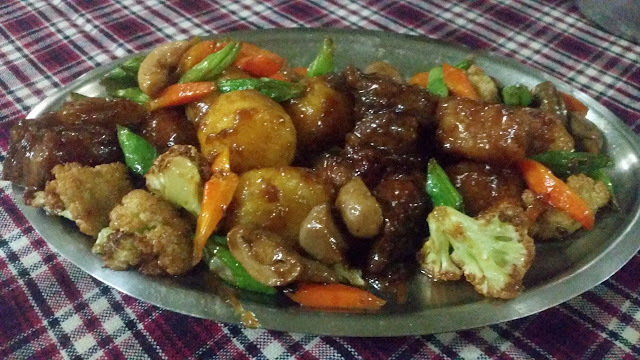 Pa is the second most popular dish in Bhutan. 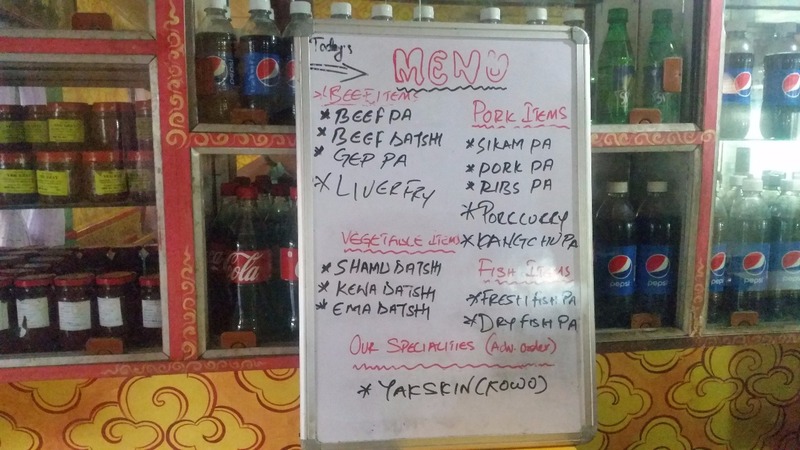 It can be prepared with fish, meat, dry meat and even intestines (called Gep). Usually, either local leafy vegetables or radish found in abundance is used in the preparation along with red chillies and oil. 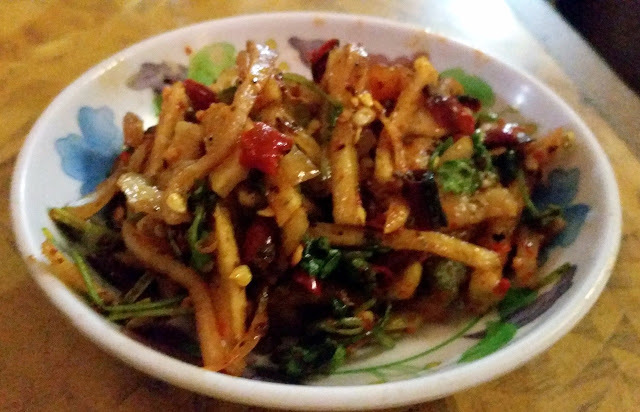 It is a dry dish, usually eaten with rice, but it can even be eaten standalone. 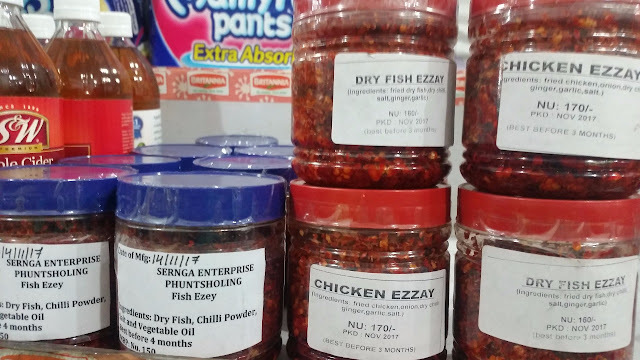 Any Bhutanese meal is not complete with Ezey, a red chilli based chutney or salad. 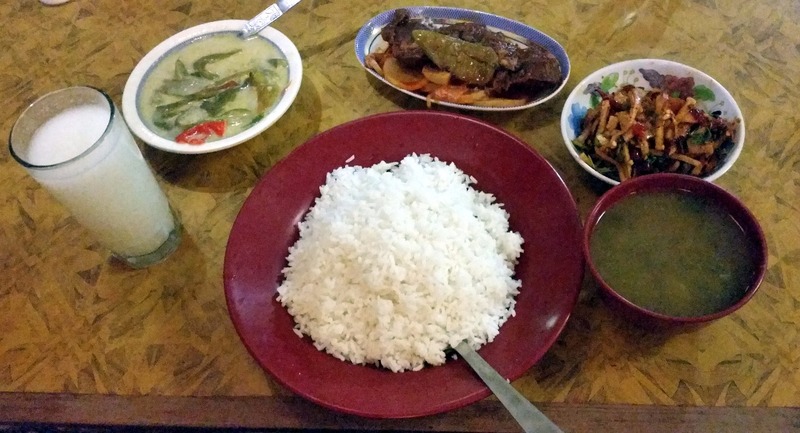 Over the trip, I have encountered varieties of this dish, which I will keep on explaining in the travelogue. The first meal is decidedly delicious, though very spicy. The Norsha Pa with chunks of radish was one of the best I will have on the entire journey. As we have to leave for Thimpu next morning, we spend some time in the Bhutanese market, looking at some handicrafts and souvenirs. The supermarkets have some bottled ezey as well as Dalle chillies which we make a mental note to buy on our return. Our dinner is a simple affair at the restaurant of our hotel. The Cheese Momo is a delight, the hotel staff tells us that they use Amul cheese from India instead of the local churpi cheese. 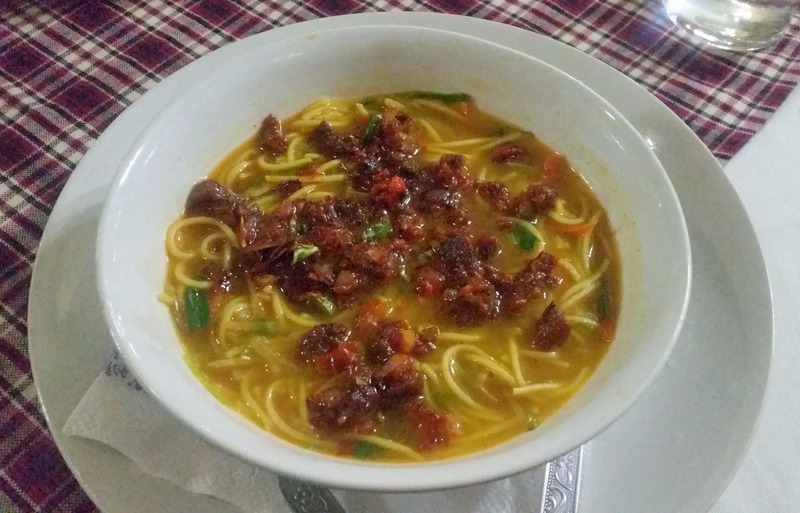 The Thukpa here uses dried lamb and thin noodles. 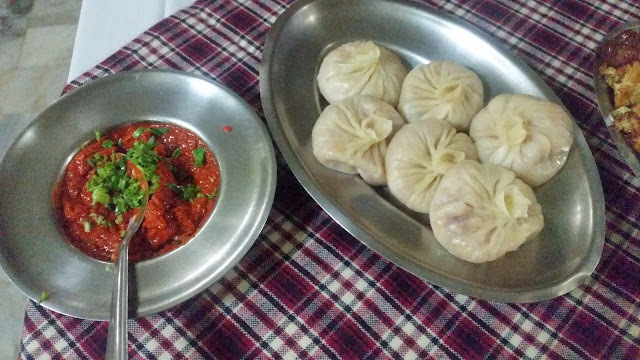 There are various versions of the dish in Bhutan using flat noodles or the handmade variety. We also try Roast Pork with Vegetables, a dish which has a distinct Chinese influence. Bhutan shares a significant amount of its border with China. 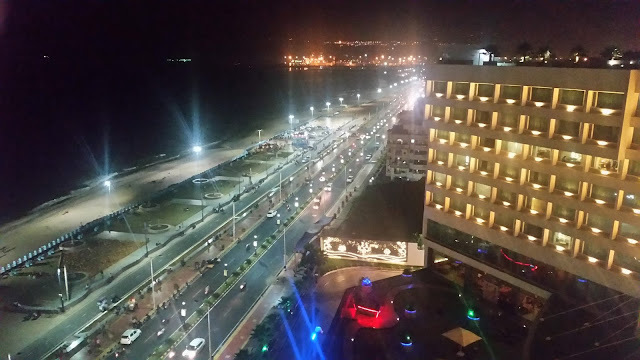 We retire early in the night as we are quite exhausted after a long journey. We have loved our experience on our first day in Bhutan and are looking forward to the next day with a lot of expectations.